Visited the scene of my Chinese literature again. Emotions are universal and timeless. Chanced upon Shen's Garden in Shaoxing, just like how Lu You (1125–1210) chanced upon Tang Wan, his former wife in the same Shen's Garden (well, may not be the exact spot. 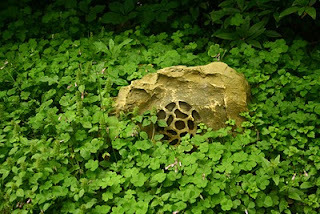 The garden may have shifted locations after all this time) that I visited. A well-camouflaged speaker, in the form of a "rock", that plays Chinese music in the garden. Lu You, under the pressure from his mother, divorced his first wife, Tang Wan, whom he grew up together with. He met her again after some years in Shen Garden when she was already wife of someone else, and he himself had remarried. Emotions were thick when Tang Wan brought him a toast. After the brief encounter, he wrote a poem (to be exact, lyrics) on the walls of the garden. 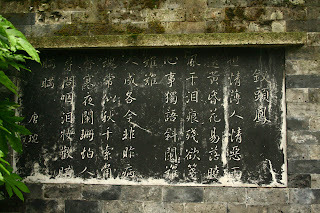 Tang Wan wrote a poem in response to his. She passed away a year later. Today, visitors could see the encravings of their works on the walls, reminiscing in the pain of these ill-fated lovers. 红酥手，黄縢酒， With your rosy, soft hands, a toast of good wine was brought to me. 一怀愁绪，几年离索，A heart full of sorrow for these years of living asunder. 错，错，错。 All but a mistake! A mistake! A mistake! 春如旧，人空瘦， While spring seemed untouched by time; lovesickness caused one to grow empty and thin. 泪痕红浥鲛绡透。 Traces of tears drenched the handkerchief. 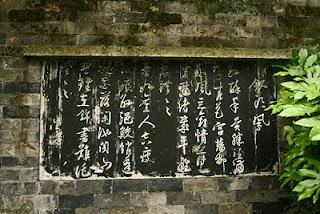 山盟虽在，锦书难托，The oath of yesterday remains but no longer can we converse through letters. 莫，莫，莫。 Forget it! Forget it! Forget it! 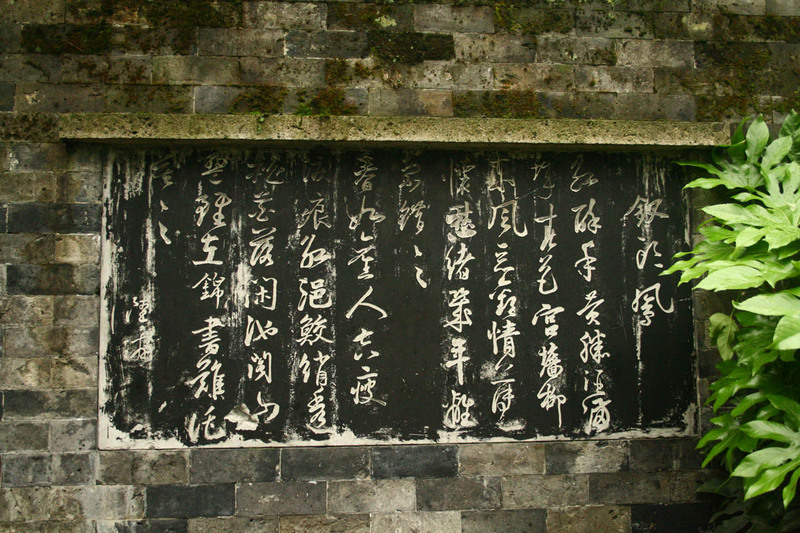 Poetry was a common tool of expression in ancient China, thus the tradition of writing poems. Emotions, thoughts, ideals are captured within the scope of a poem. The Book of poems was compiled as early as 1046BC - 771BC. It is not without regret that none of these ancient Chinese poets could hold a candle to the international fame that Shakespeare enjoys.